Being tasked with a response to the State of the Union address isn't easy. The message, usually given by a fresh face, is carefully crafted to fluff up a party's priorities for the coming months, as well as offer Americans a distinction between their agenda and what the president offered them earlier in the evening. This year, the Republican response to the State of the Union was delivered by Sen. Joni Ernst (R-IA), who did about as well as can be expected. The overall message, though, was underwhelming, lacking many big ideas. Outside of her compelling personal story and a nod to tax reform, there wasn't much substance there. Sen. Rand Paul (R-KY), however, delivered his own response, offering a compelling agenda for where Congress should lead the country while offering a rebuttal to the rather rosy picture of the state of the union painted by President Barack Obama. While President Obama spent much time focusing on and defending his economic record, Paul noted that the more than five-year recovery has left many people behind, which, he noted, is a result of the policies enacted by the administration and those before it. "For those of us who feel separated and distant from the American Dream, we don’t want to be perpetually talked down to, forgotten, and left in perpetual poverty. Many are discouraged that the 'gifts' offered by liberals have not generated wealth, but rather perpetuated poverty," said Paul. "The war on poverty is 50 years old, and black unemployment is twice that of white unemployment. Income inequality has worsened under this Administration, and tonight President Obama offers more of the same policies—policies that have allowed the poor to get poorer, and the rich to get richer." Though President Obama proposed hundreds of billions of dollars in spending and tax hikes, Paul explained that these redistributive policies are counterproductive. He honed his background as a doctor, saying that the approach of lawmakers should be "do no harm." The Kentucky Republican, who's proposed a five-year balanced budget plan, urged Congress to mitigate the $18 trillion national debt by passing a constitutional amendment mandating a balanced budget. This financial burden, Paul said costs the economy "a million jobs a year" and is also "an imminent threat to our national security." There was also agreement with President Obama, who, in his address to Congress, touched on the topic of criminal justice reform. This has been an area of focus for Paul, who has introduced legislation to end law enforcement agencies' egregious abuse of civil asset forfeiture laws and give nonviolent offenders a second chance. "Dr. Martin Luther King spoke of two Americas. He described them as 'two starkly different American experiences that exist side by side.' In one America, people experienced “the opportunity of life, liberty, and the pursuit of happiness in all its dimensions.' In the other America, people experienced a 'daily ugliness' that dashes hope and leaves only 'the fatigue of despair,'" Paul noted. "There is a tension that has become visible in the protests in every major American city. As Congressman John Lewis put it: 'There is a growing discontent in this country.'" "I think peace will come when those of us who have enjoyed the American Dream become aware of those who are missing out on the American Dream," he said. "The future of our country will be secure when we break down the wall that separates us from 'the other America.'" 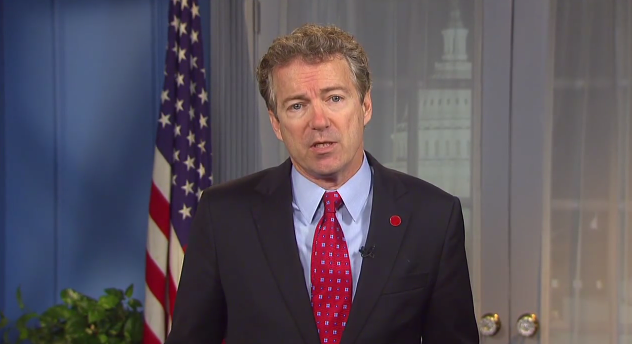 Though there were only a couple references to 2010 healthcare law in the official Republican response, Paul acknowledged that it's a "moral obligation" to ensure that "medical treatment is made available to all," but he highlighted the some of the biggest problems with ObamaCare. "President Obama’s fundamental promise that if you like your doctor you can keep them—was a lie. ObamaCare, at its core, takes away a patient’s right to choose. Under ObamaCare, patients are prohibited from choosing their doctor or their insurance," said Paul. "Today, more Americans may have medical insurance, but Americans are now paying more money for worse care. The relationship between doctor and patient is withering. Doctors are fleeing the profession they love. Hospitals are straining, closing, or refusing to accept ObamaCare policies. Everyone knows our health care system needed reforming, but it was the wrong prescription to choose more government instead of more consumer choice and competition." "ObamaCare restricts freedom and must be repealed!" he forcefully declared. The Kentucky Republican spent some time on civil liberties, an area that received a passing mention from President Obama and no acknowledgement at all in the official Republican response. "The Constitution is clear. Politicians should not collect [Americans phone records] without a warrant. Warrants must be specific to an individual and there must be probable cause before government is allowed to search any American’s documents," he said, referring to the Fourth Amendment. He called on President Obama, who authorized and has subsequently reauthorized domestic spying, to "immediately end this invasion of our privacy." Paul also touched on several other policies on which he'll be heavily engaged, including an audit of defense spending, ending cronyism, and economic prosperity. Though he warned that the nation is currently on a precarious path, Paul offered a vision of hope, saying that "there is still much promise for the future of America." On behalf of our activist community, I urge you to contact your representative and senators and ask them to cosponsor the resolution recognizing the national debt as a threat to national security, H.Res. 149 and S.Res. 78. Introduced by Rep. Andy Biggs (R-Ariz.) and Sen. David Perdue (R-Ga.), the resolution offers inconvenient facts about the national debt, the unchecked growth of which will cause severe national security and economic problems for the United States. As Congress reflects on its success in passing the First Step Act at the end of 2018, it must look toward ways to build on the existing momentum. The First Step Act was constructed to shift our justice system toward ensuring that we are incarcerating the right people for the right amount of time and that while people are incarcerated, our correctional system is using resources wisely to rehabilitate inmates. It makes steps toward reentry initiatives following incarceration by reauthorizing the Second Chance Act but leaves much still to be done in the space of breaking down barriers to reentry to allow rehabilitated inmates to be successful in society.